Mechanical structures are becoming more and more complex. At the same time, complex materials are being used, such as composites. Among the several types of composites, fiber reinforced polymers are made of reinforcements fibers (mostly in glass or in carbon) that are kept together with a polymer resin (mostly epoxy). The polymer resin makes these composites very light while the reinforcement fibers provide them excellent stiffness and strength. Such composite materials, therefore, are highly attractive in applications where lightweight but very strong materials are required, such as in airplanes, wind turbine blades, race bikes, etc. However, due to the composite nature and inherent anisotropy of these materials, their mechanical behavior (for example their failure mechanism) is more difficult to predict than in traditional materials such as metals. For this reason, mechanical structures are sometimes overdimensioned, and replaced too early (for precautionary reasons) or too late (after failure of the construction). It would therefore be interesting to integrate sensors in such materials in order to monitor them in real time and to be able to predict ageing or failure mechanisms. This would prolong their lifetime and significantly decrease the environmental impact through a reduced use of raw materials and energy savings. Traditionally, strain gauges have been used for this purpose, but more recently, the optical variant, i.e. a fiber with Bragg grating sensors has been adopted. Such optical fiber sensors are very inert, not susceptible to electromagnetic interference, and are very small, making them suitable for integration in composites. However, fiber sensors are mainly sensitive to strain in their longitudinal direction and therefore to know the total strain vector in a certain point of a material, multiple fibers under different orientations must be placed which is very challenging. This was solved by implementing this optical sensing mechanism in a thin polymer foil instead of a fiber. 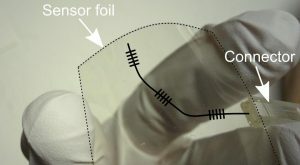 The orientation of the sensors on the foil is fixed during fabrication, so that it can easily be installed without disturbing the sensor orientation. Furthermore, those sensor foils can be made very thin (down to 50μm) so that they can be embedded inside composite materials during their fabrication. This protects them from the sometimes harsh operating environments, does not require the use of glue (without thus affecting the strain transfer) and allows monitoring the structure’s interior. Since these sensor foils are made from polymers, they are very flexible and could also serve applications in which they need to be elongated significantly or bent to small radii. In this study by Jeroen Missinne et al. from Ghent University have investigated bending the sensors down to a radius of 11 mm, and elongating by 1.4% without losing functionality, but further improvements are possible.